Editorials from Theslowlane: Chuckanut Ridge. Large new subdivision or 100 acre woods? Chuckanut Ridge. Large new subdivision or 100 acre woods? Land that hasn't yet been developed, but is privately owned. Buying it for open space would be expensive. Covering it with houses would be difficult due to wetlands and much opposition from neighbors. I've read that developers plan to cluster the housing into duplexes, townhouses and so forth to build around wetlands and allow some open space to remain. Trails would be included and buffering along the Interurban Trail which passes near the property would be preserved. Better than many existing neighborhoods. 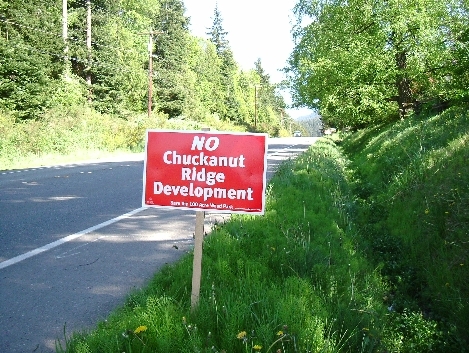 Still, this isn't enough to satisfy folks who would like to preserve Chuckanut Ridge as open space. Probably not in this society; especially on the outskirts of the city. Usually high rise living is closer to the core of a city. Still, it's an idea, if more people lived and thought like me. I'm not real anti development out there. I've never walked back in there to fall in love with those woods. Maybe I wouldn't miss it and development has to go somewhere as long as people keep having kids and moving here. Still, in some ways, it's sad that population keeps growing and land has become so expensive. One of a bunch of "NO" signs along Chuckanut Drive in south part of Bellingham, WA. There is an opinion piece in the B'ham Weekly by Bob Keller about Chuckanut Ridge that captures my feelings on this issue, pointing out that at $14 million, this would be an overpriced park that would drain Greenways money that could be spent much more effectively elsewhere. I've seen the flood of letters to area papers about how unfair it is that citizens have no say in planning, that all these plans are cooked up in secret, but I was one of maybe 300 people to attend Bellingham's Growth Forum last summer and fall, not a big turnout for a city our size. But now all the NIMBY's concerned about the view and parking within (but no further than) 1/4 mile of their house want to derail the planning process in its final stages, costing the city and developer scads of money, all because they were too lazy and apathetic to do something about growth when it effected someone other than themselves. Well, screw those selfish, narcissistic whiners. The alternative to density is sprawl, and I'm not willing to trade the South Fork Valley to preserve suburban size lots in an urban setting. Besides, if we get dense enough we'll have better transit service. I like urban villages, having lived in a couple in Germany. I like being able to walk to the bakery, the produce market, the hardware store and coffee shop. I like it being difficult to find places for cars but easy to find places for people. Tear down the parking lots, not the trees. Density begins with wasted space, not unused space. I don't live in this neighborhood, but I'd rather spend $14 million to preserve an urban park, habitat area & trail system everyone can use than pay double that to subsidize one developer's fortune. This area serves six distinct neighborhoods and five public schools; and anyone who believes most of the kids within walking distance live in big suburban lots must not be familiar with Happy Valley. I don't live in this neighborhood, but I'd rather spend $14 million to preserve an urban park, habitat area & trail system everyone can benefit from than pay double that to subsidize one developer's private housing project. This Chuckanut Ridge area serves six distinct neighborhoods and five public schools; and anyone who believes most of the kids within walking distance live on big suburban lots must not be familiar with Happy Valley and the thousands of dense apartment units scattered throughout the Southside. The fact that more people are speaking out now than attended the Growth Forum last summer is justification enough to re-think this whole Urban Village concept, and ensure that it occurs at a sustainable, 20-year pace where infrastructure to support it (roads, schools, jobs) adequately exists. The middle of the woods in a second-growth forest and wetlands habitat on a scenic route along our coastal Chuckanut Mountains is not such a place. Those who support public acquisition of this property support equitable green-space acquisition throughout the City and County, as defined by those neighborhoods that will be most adversely impacted by mega developments. This is not a NIMBY concern; it is a concern for all Bellingham citizens who care about this community's future and the need to prevent sprawl in urban as well as rural areas. The manner in which 'infill' is defined and carried out should be determined by informed public consent, not by development interests supported by trendy land-use consultants disguised as Growth Forums. Urban Villages that actually work are mainly in Europe, because there people are more concerned with the common good and have laws in place to protect and enhance their environment rather than allow it to be destroyed all around them by financial interests. Now that we are becoming informed on this issue, we can see that places like the Fairhaven Business District may be good sites for an Urban Village, but Chuckanut Ridge is neither in Fairhaven nor anywhere near what could be considered an appropriate location for an Urban Village. Even those Urban Village "experts" who spoke at the Growth Forums agree on this. Now it's 2010 after the 2008 land crash, so to speak. The crash that also, for the most part brought down Horizon Bank. Now I hear that parcel of land is worth a lot less than it was in 2005, during the "bubble." The new bank (Washington Federal) that took over Horizon after FDIC closure is less interested managing development. Seems like it's planning to sell the land. In the past, I had thought that land was too expensive for the city to buy (with Greenway money and so forth). Buying it could jeopardize money for other more needed open space acquisitions; such as trails in the Cordota area. Well, now it looks like the Chuckanut Ridge land is less expensive than before and could be a better deal. Still, I don't have a strong opinion about what happens to it. Maybe it will remain open space, or possibly developers will still build there, especially if market inflates again. It's an interesting "planning controversy," but I don't have strong preferences one way or another.